Today, I received a query from one of my blog readers asking how to get the current value from a sequence ? He also mentioned to me that he usually uses given below (Database console command) script to get the current value from identity column. So, do we have any DBCC command like this to get the current value from sequence object? Basically we do not have any DBCC command to get the current value from sequence same like identity but we do have work around to find it. Given below are the two methods to get the current value from any sequence object. 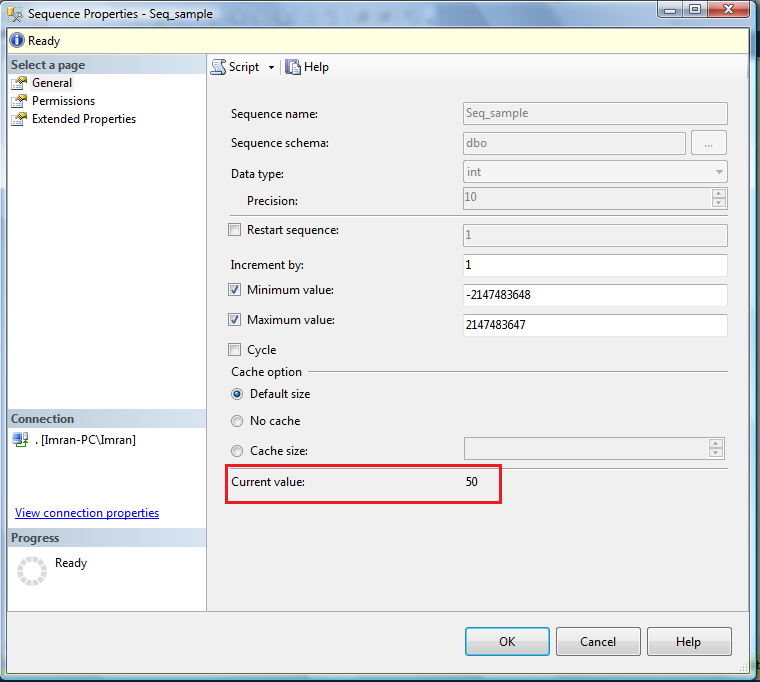 In this method, you need to open SQL Server Management Studio and select the particular database and further select the sequence object in which current value is required. Then right click on it and browse its property to view the current value as shown in the image below. 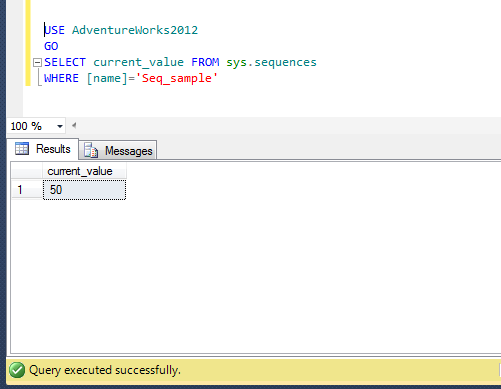 In this method, you need to open a NEW query window in SSMS and write the given below script to get the current value of sequence using sys.sequences (A new system view shipped in SQL Server 2012). 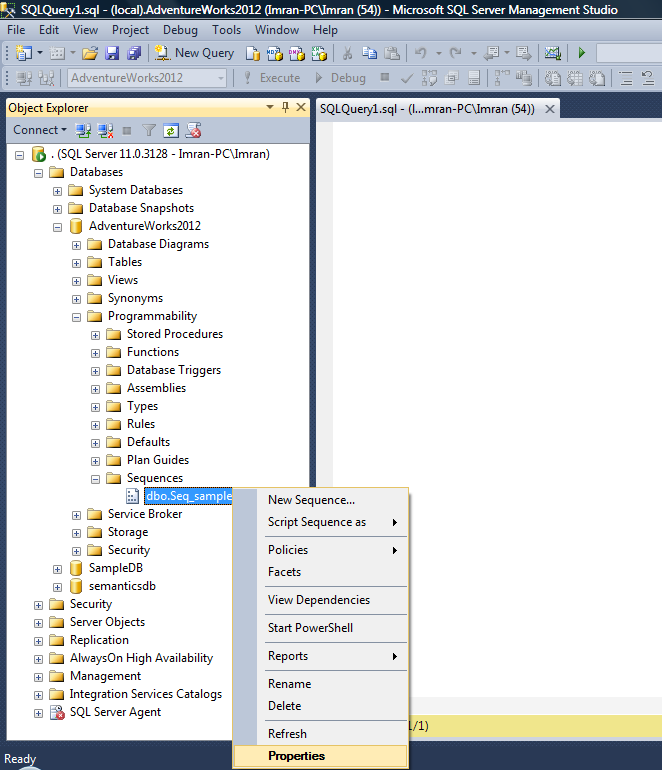 Sequence object is one of the nice features shipped with SQL Server 2012. It gives much more flexibility than identity column. Due to its flexibility, I usually recommend to use it instead of identity. But recently I came across with a so called issue related to sequence object. The issue is that sequence object does not enforce uniqueness by itself. Let me create a sample to demonstrate the issue step by step. Create a sample table. Given below is the script. Create a sequence object with CYCLE property. 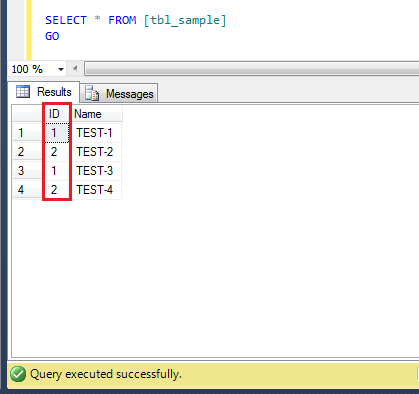 Insert few records in the above sample table using sequence object. Browse the table. Given below is the script. As you can see in the above result set, there are duplicate IDs in the ID column. Ooopsss it does not enforce uniqueness by default. So what is the solution ? Create a unique index on column ID of sample table. Create a sequence object with NO CYCLE property. Insert few records in the above sample table using sequence object to check whether the uniqueness is enforced or not. Browse the table again. Given below is the script. Whenever you need to enforce uniqueness in the table using sequence object, make sure you have a UNIQUE INDEX on that particular column of the table. Also make sure that SEQUENCE object has NO CYCLE property. Let me demonstrate the issue and its resolution step by step. 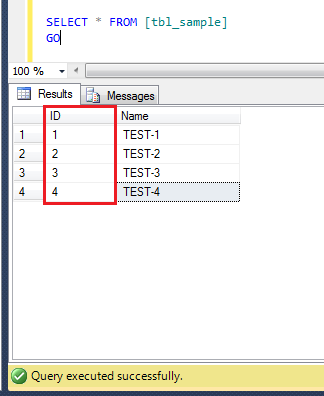 In this step, we will create a sequence object using smallint data type. In this step, we will use 3 sequence IDs. This step is just for demonstration purpose only. Let’s try to alter its datatype. This step is just to demonstrate the error only. Argument ‘AS’ cannot be used in an ALTER SEQUENCE statement. Ooopsss cannot change it. So, what is the solution ? In this step, we need to get the current value (last value) of the above sequence object. Never skip this step because once you drop the above sequence object, it would be very difficult to get the current value if it is implemented for multiple tables. Once you have the current value of the above sequence, it is time to drop the sequence object. Now, it is time to re-create the sequence object. Make sure that you change the datatype of the sequence object. Also you must change the START value of the new sequence object’s to the current value + 1 (we got the current value in step 3). Finally, check the next value of the sequence.